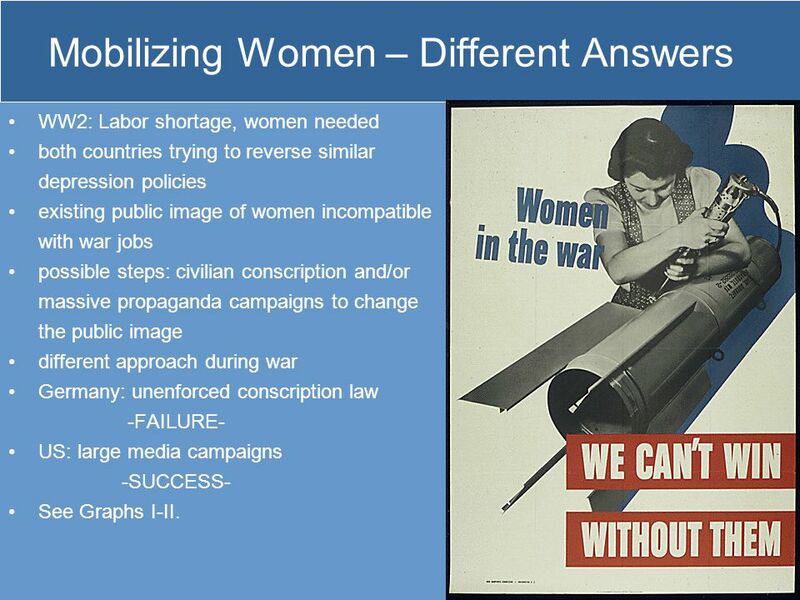 WW2: Labor shortage, women needed both countries trying to reverse similar depression policies existing public image of women incompatible with war jobs possible steps: civilian conscription and/or massive propaganda campaigns to change the public image different approach during war Germany: unenforced conscription law -FAILURE- US: large media campaigns -SUCCESS- See Graphs I-II. 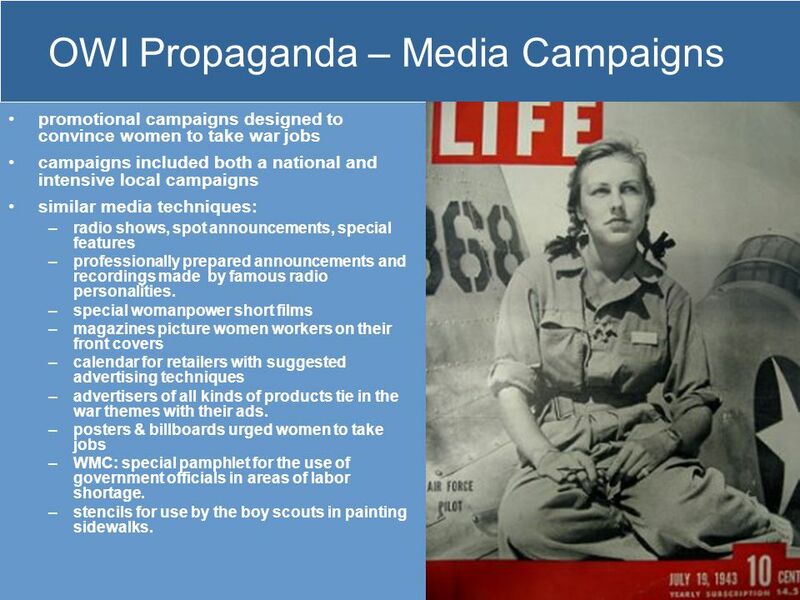 promotional campaigns designed to convince women to take war jobs campaigns included both a national and intensive local campaigns similar media techniques: radio shows, spot announcements, special features professionally prepared announcements and recordings made by famous radio personalities. special womanpower short films magazines picture women workers on their front covers calendar for retailers with suggested advertising techniques advertisers of all kinds of products tie in the war themes with their ads. posters & billboards urged women to take jobs WMC: special pamphlet for the use of government officials in areas of labor shortage. stencils for use by the boy scouts in painting sidewalks. 6 Altering The Public Image of Women 1. 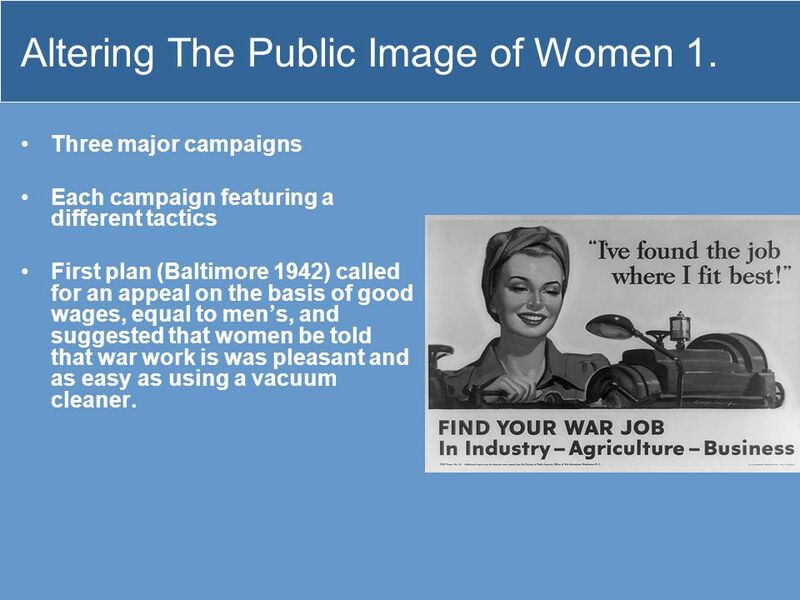 Three major campaigns Each campaign featuring a different tactics First plan (Baltimore 1942) called for an appeal on the basis of good wages, equal to men’s, and suggested that women be told that war work is was pleasant and as easy as using a vacuum cleaner. 7 Altering The Public Image of Women 2. 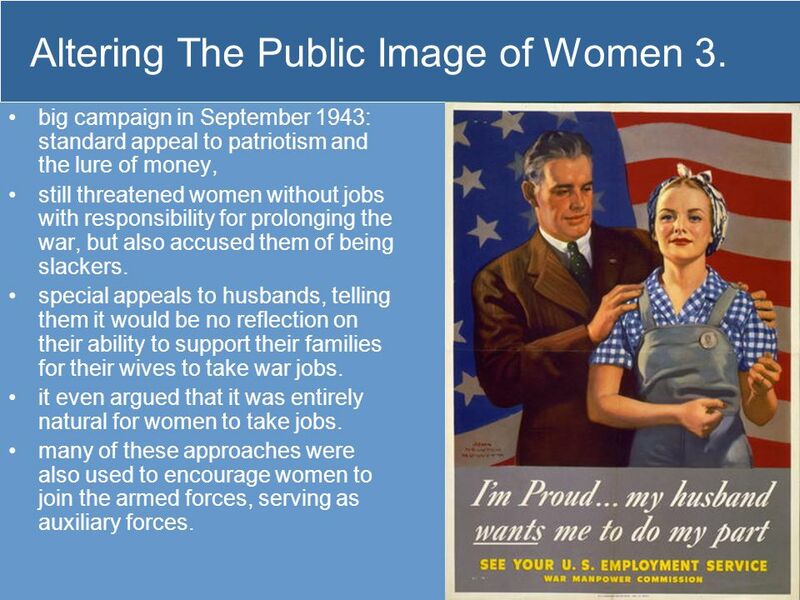 8 Altering The Public Image of Women 3.
big campaign in September 1943: standard appeal to patriotism and the lure of money, still threatened women without jobs with responsibility for prolonging the war, but also accused them of being slackers. special appeals to husbands, telling them it would be no reflection on their ability to support their families for their wives to take war jobs. it even argued that it was entirely natural for women to take jobs. 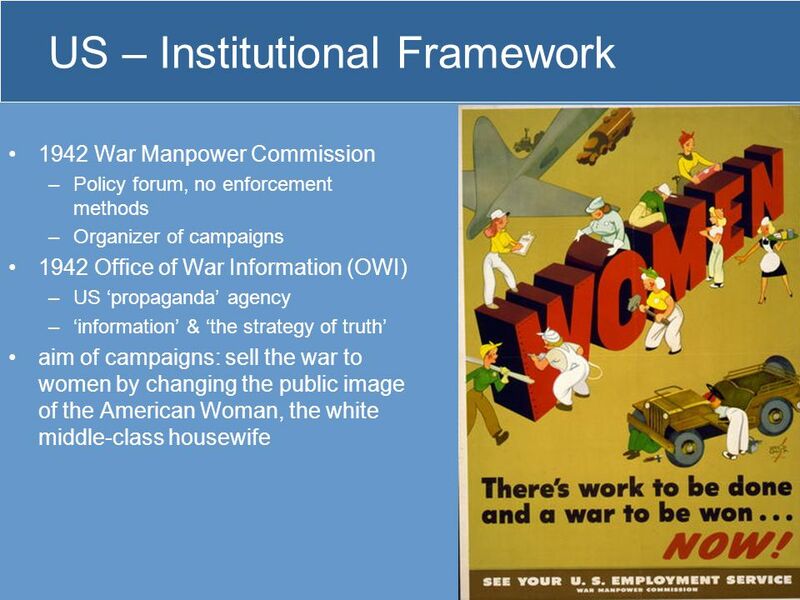 many of these approaches were also used to encourage women to join the armed forces, serving as auxiliary forces. Propaganda as a legitimate tool Ministry of Popular Enlightenment and Propaganda Dual institutional Party/State structure in the control of the media and in propaganda dissemination Aims of nazi propaganda Media used: print media, broadcast media, public meetings, slide lectures, films, newsreels, posters, badges, word of mouth, bulletin boards even in the most remote communities Prominent role of the Bund Deutscher Mädel and Frauenschaft in propaganda addressed to women. 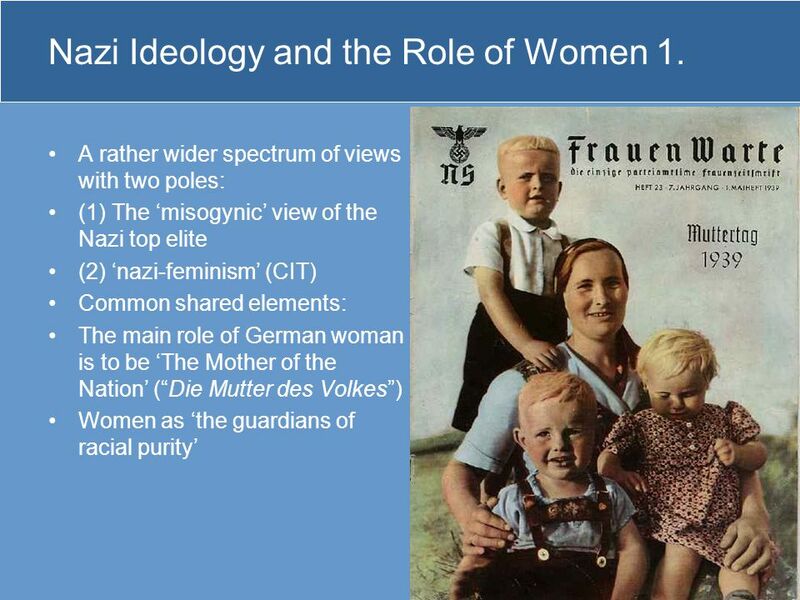 11 Nazi Ideology and the Role of Women 1. 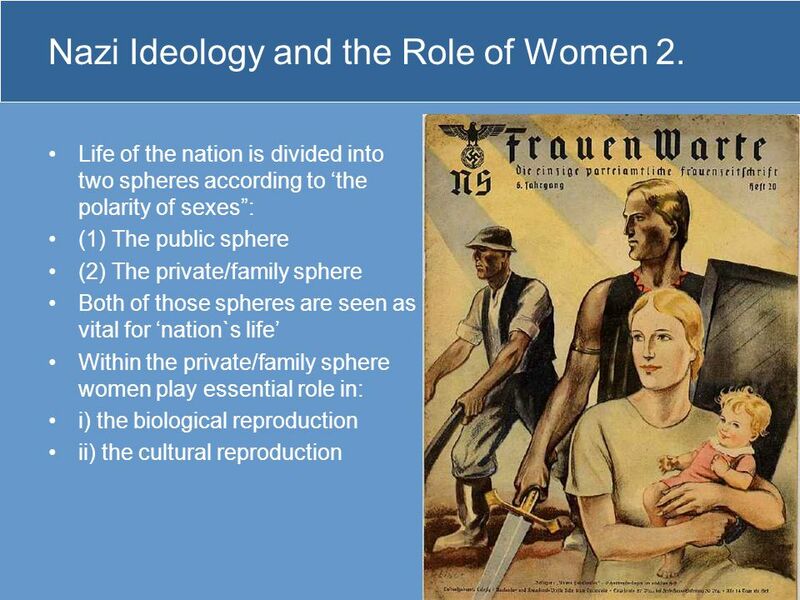 12 Nazi Ideology and the Role of Women 2. 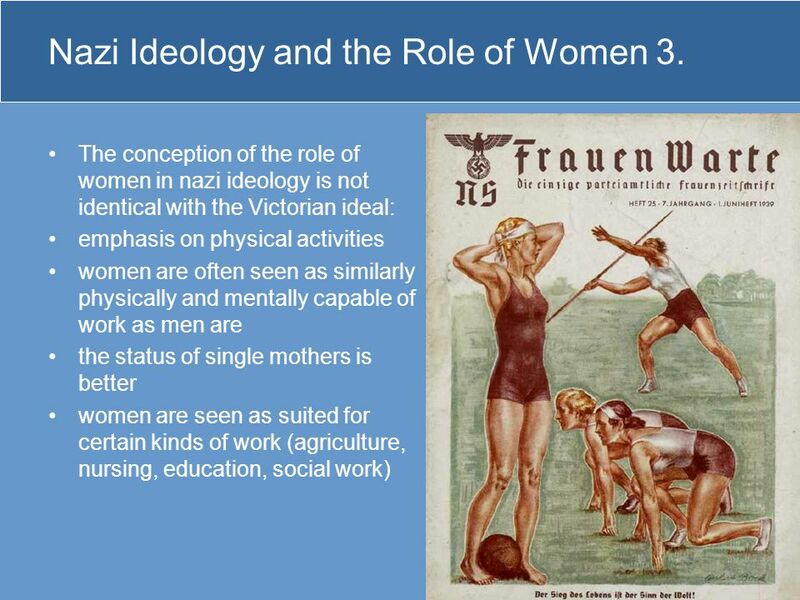 13 Nazi Ideology and the Role of Women 3. 14 WW II German Propaganda 1. 15 WW II German Propaganda 2. 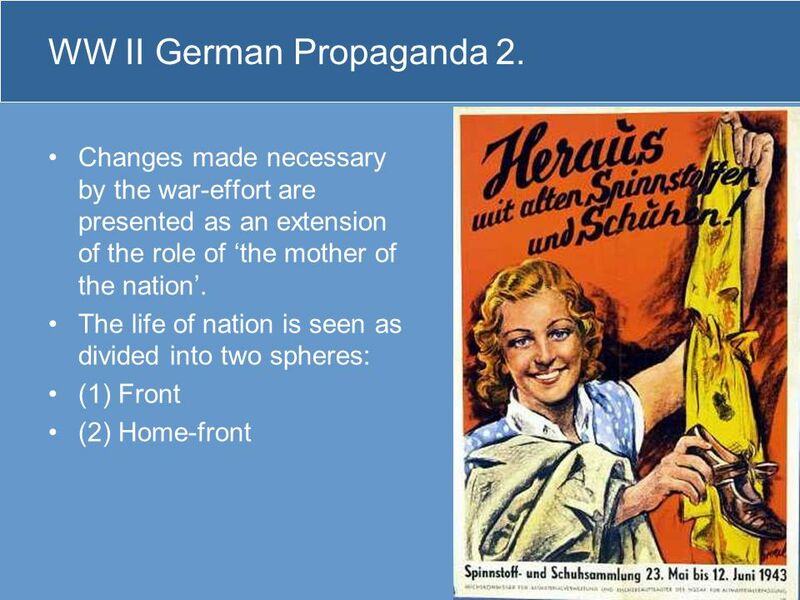 16 WW II German Propaganda 3. 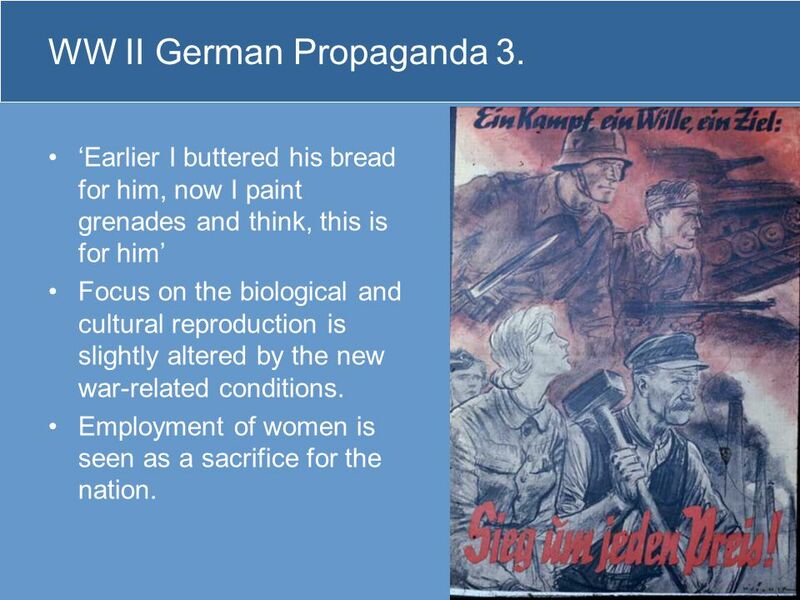 ‘Earlier I buttered his bread for him, now I paint grenades and think, this is for him’ Focus on the biological and cultural reproduction is slightly altered by the new war-related conditions. Employment of women is seen as a sacrifice for the nation. 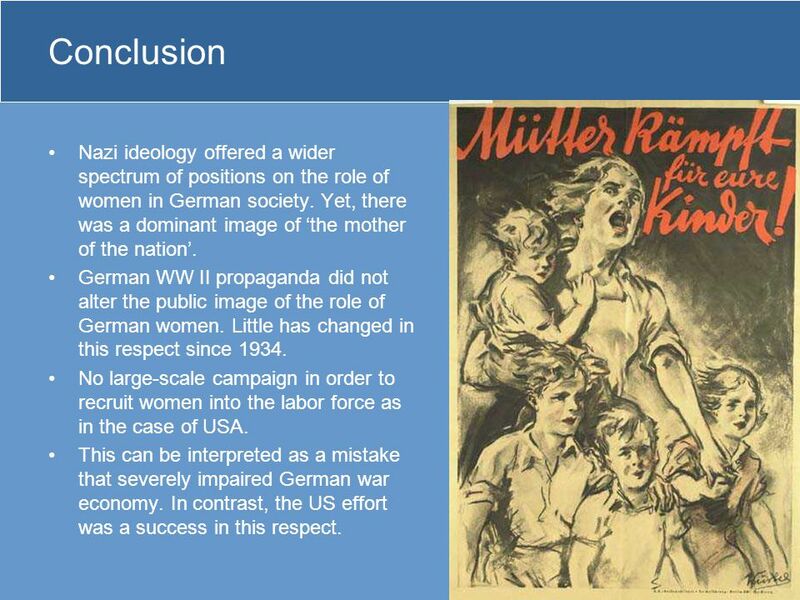 17 Conclusion Nazi ideology offered a wider spectrum of positions on the role of women in German society. Yet, there was a dominant image of ‘the mother of the nation’. 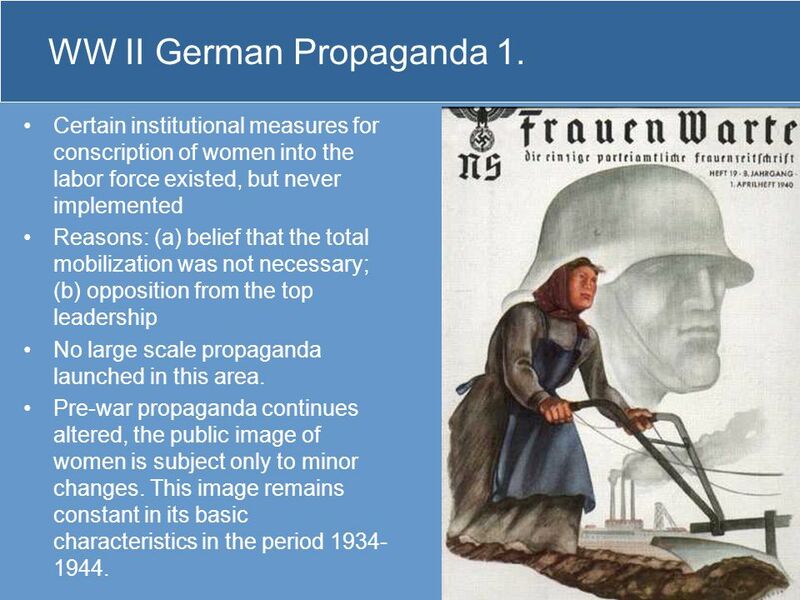 German WW II propaganda did not alter the public image of the role of German women. Little has changed in this respect since 1934. 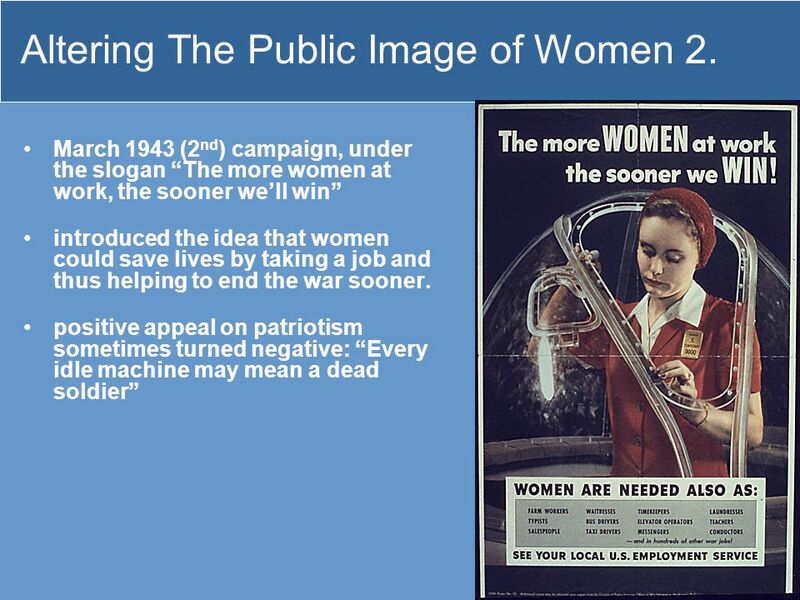 No large-scale campaign in order to recruit women into the labor force as in the case of USA. This can be interpreted as a mistake that severely impaired German war economy. In contrast, the US effort was a success in this respect. 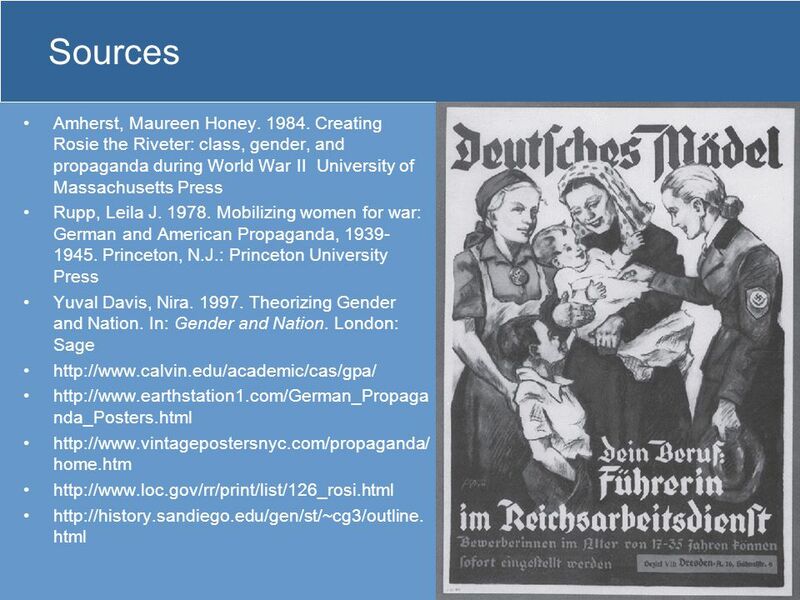 Download ppt "Mobilizing Women in World War II"
American propaganda during World War II By Julie Finnøy. World War II Posters and Propaganda Posters created during WWII were used as motivation and propaganda. As each poster comes up, look for: Posters created. History of the Holocaust. 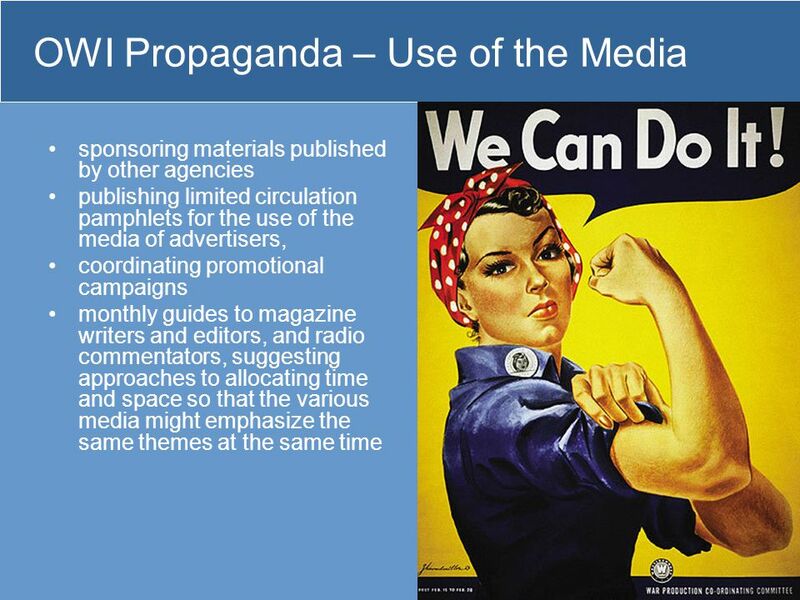  Propaganda is the use of the Media to promote one point of view.  Propaganda is brainwashing the public, convincing them. PROPAGA NDA What is it? How is it used?. Definition O Propaganda is information, especially of a biased or misleading nature, used to promote or publicize. Sarah Fischer Katelyn Smith Julienne Boone Propaganda : ideas, facts, or allegations spread deliberately to further one's cause or to damage an opposing. Look at this picture and think about the following things: o What do you think this poster is about? (have a guess) o Why would he be waving a flag? 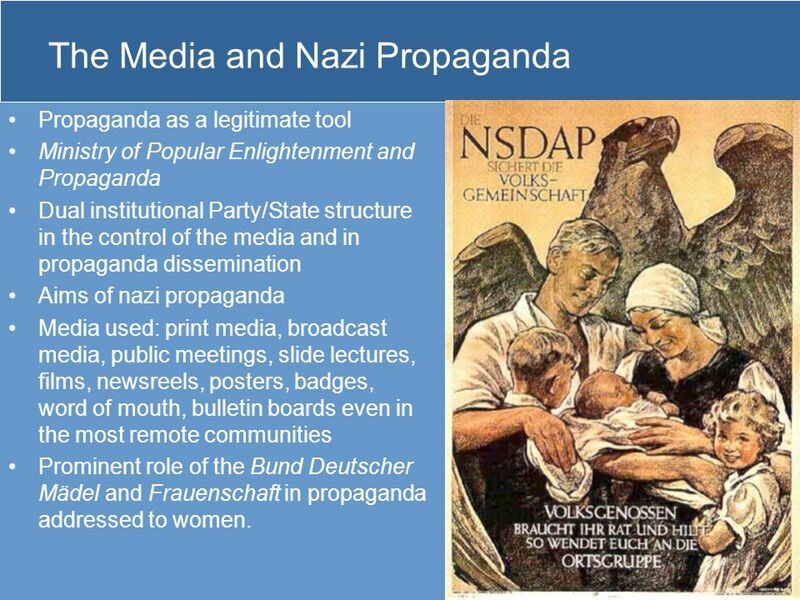 o.
Nazi Propaganda Today you will be taking notes. 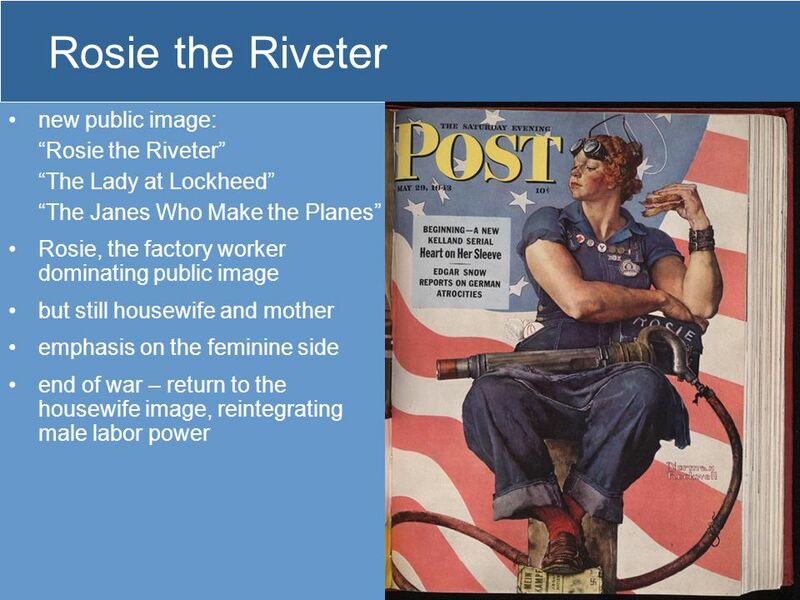 One of the most famous American posters from the war, it shows the iconic "Rosie the Riveter" as an encouragement to the millions of American women who. Public Policy A general agreement of how government will deal with certain issues or problems of the community Example: the Town Center- encouraging the. © Boardworks Ltd of 18 These icons indicate that teacher’s notes or useful web addresses are available in the Notes Page. This icon indicates that. 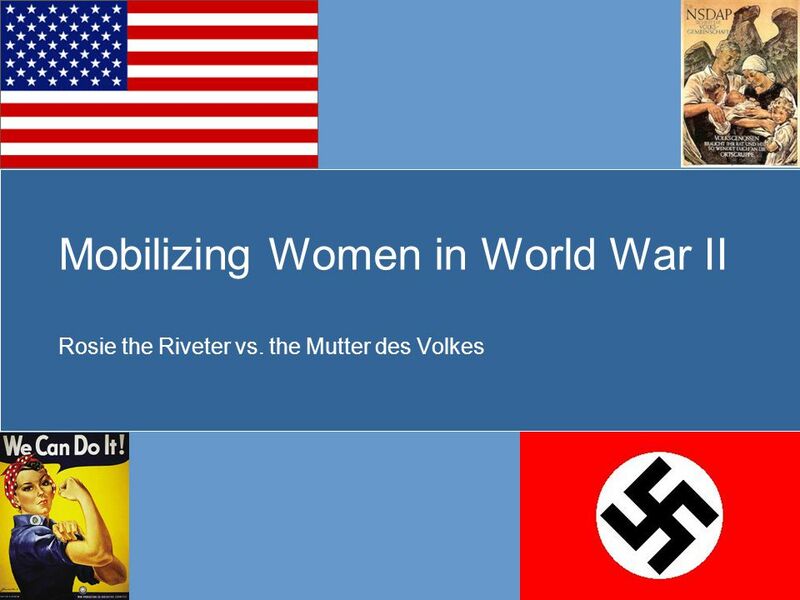 This title comes from the poster “It’s a woman’s war too!”.